Last evening before heading to a Colony Hotel outing, I did a quick mission shopping stop by my mall's Nordstrom. 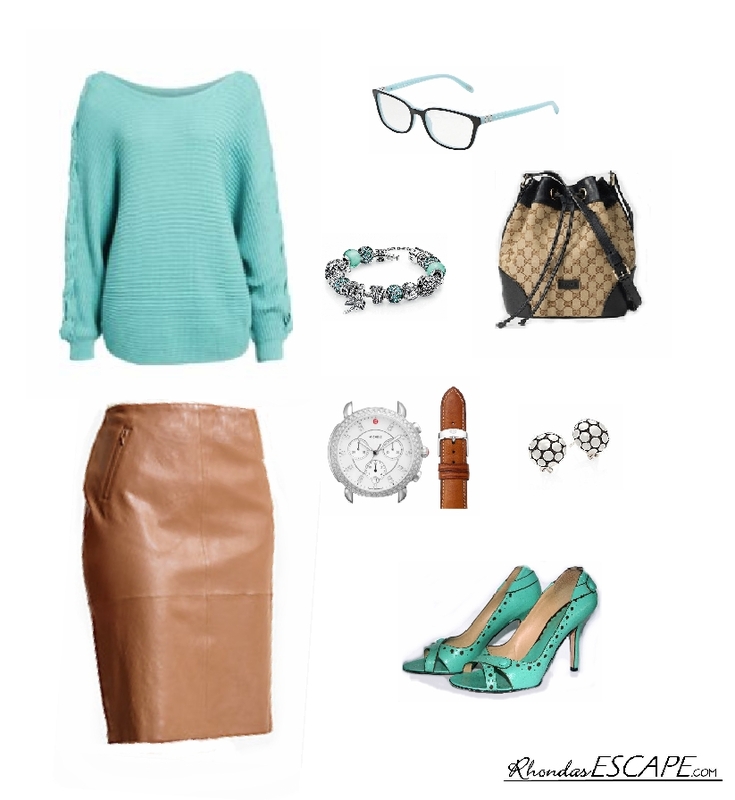 I had seen the above teal green sweater a few days earlier as I was passing through and trough it looked cute. My stop was to try it on. It is described as a "Lace-Up Sleeve Sweater" by Calson. The "braided laces embellish" which go from neck-line to sleeve make a nice fashion accent. ($59.00 - reasonable) It is available in regular and large sizes on-line. Sizing note: I was happy I took the time to try it and did not order on-line. I ended up purchasing a small and still have plenty of room - it runs large. One other comment on the teal/green sweater. I find that as a color, teal looks good with many other colors. It is hard to match with other greens or pastels however with white, grey, brown or black it coordinates well. With my hair color now and when I had red, it was a great standout color. When I got home I searched around my closet for other items to match it. First stop - I love my leather skirts and the one above is from Talbots - it is described online as a "Stretch Leather Pencil Skirt" and is still available in regular length (23") or if you like it a little shorter petite (21"). A great alternative to the leather skirt will be my "go to" white knit pants or my Lauren white sailor jeans. Either will be great for cool spring evenings. The pumps are from BCBG Maxazria and are at least a decade old - still comfortable and super cute. I have owned them so long, I could not find an image on Google so took my own photo. I have the exact shoes from BCBG in black with white dots and wear them a lot. The Pandora Charm Bracelet, Tiffany eye glasses, Michele Sidney Watch and Gucci drawstring bag rounds out the look. All of these items I wear regularly and they work with the sweater to pull together a total look. The sweater is a little heavy for South Florida, however this winter we had cool days/nights, so perfect. Also, I have a trip coming up to Toronto (Febuary 12-17), so great for under my coat. This absolutely is one of my favorite part of femininity. The variety or outfits, looks, and versatility. However - The cherry on the Sundae is pulling it all together and going out with a confident attitude. Dress well - Enjoy your ESCAPE. Is Plastic Surgery for You?